This story is part of "Eat The Enemy," a HuffPost series on edible invasive species, non-native plants and animals you can help contain from the comfort of your dinner table. Not all invasive species are edible, and some included in this series can be dangerous, including lionfish and wild boar. Please take caution when foraging or hunting for your own food. Even if you haven't heard of them, you've probably seen a lionfish in an aquarium. The fish are native to the South Pacific and Indian Ocean, but have recently been creating big problems for the Caribbean, Gulf of Mexico and the East Coast of the United States. In the past decade, the little fish has started to take over reefs and push out native species. Lionfish appeared off the coast of Florida in the early 1990s, but it wasn't until the 2000s that their population exploded and the fish spread to the coasts of other countries. We'll probably never know for sure how the lionfish made the jump from the Pacific to the Atlantic, but many suspect it may have arrived in Florida as an aquarium pet released into the ocean. The U.S. Geological Survey has a terrifying graphic that shows how quickly they have spread in the last decade. 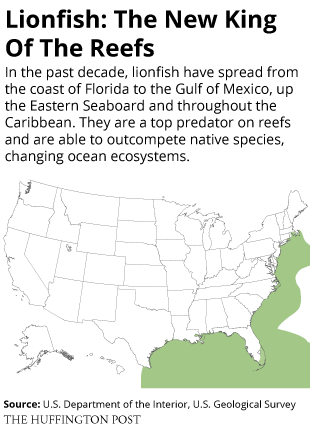 The most recent data shows lionfish as far north as Rhode Island and as far south as Venezuela. USGS biologist Pam Schofield told HuffPost that the lionfish's spread is "remarkable and unprecedented." "You can think of lionfish as a form [of] pollution -- a biological pollution -- that is spreading through our coastal waters," Schofield said. Like most invasive species, lionfish have few competitors. According to the National Oceanic and Atmospheric Administration, they are now a top predator in reef communities and eat indiscriminately, consuming more than 50 species of fish and invertebrates. They can outcompete other ocean species, cause extinctions and alter habitats. So, how to stop them? Scientists at NOAA said they think it's unlikely the lionfish will be eradicated. But it is possible to control their spread and reduce high populations. That's why some are trying to make lionfish a popular dinner item. The Reef Environmental Education Foundation, or REEF, has published a lionfish cookbook and maintains a list of restaurants serving lionfish. To reduce populations as much as possible, organizations like REEF are sponsoring derbies, where fishermen compete for prize money to see who can bag the most lionfish in a day. Still others are working on improving the market for lionfish in the Caribbean and the U.S. while improving methods to catch them. Norman's Cay in New York City is one restaurant trying to bring the issue to a mainstream audience. It serves lionfish brought from Florida, the Caribbean and the Gulf from a variety of fishermen. Lionfish cannot be caught using conventional commercial fishing methods, which makes creating a market for them difficult. Most are caught by hand, either with hand nets or by spearfishing. Ryan Chadwick, co-owner of Norman's Cay, has worked hard to secure a steady supply of lionfish for the restaurant. He discovered the lionfish problem as Norman's Cay was opening. "I thought it would be great if I could somehow incorporate serving an invasive fish on the menu in a Caribbean-themed restaurant," he said. He buys them from divers and fishermen all around the area affected by lionfish, as well as from lobster fishermen who inadvertently catch lionfish in their traps. In a new video, Chadwick explains the lionfish problem and why the restaurant decided to serve them. When we asked about trying lionfish for ourselves, Norman's Cay invited us to come down to the restaurant and see how it was prepared. We share the delicious experience with the photos below. And keep scrolling for another recipe from The Lionfish Cookbook! These lionfish have been cleaned and de-spined, and are ready to be cooked. Lionfish have spines along their back and belly that can deliver a venomous sting if touched. But the venom exists only in the spine; once removed with kitchen scissors, the fish is safe to handle and eat. Norman's Cay sources lionfish from many different divers, who spear the fish one by one, and lobster fishermen, who trap lionfish as bycatch. When the restaurant began serving lionfish, Norman's Cay co-owner Ryan Chadwick would dive for the fish himself and bring them back to the restaurant. "Unfortunately, in the beginning, it was very inefficient, I'd have to go down, dive for three or four days, catch as many fish as I could, clean them, pack them in coolers ..." Chadwick said. Chef Victor Daniels showed us one way the restaurant prepares the whole fish, by pan frying it in oil. The fish is seasoned with salt and pepper before going into the pan. Lionfish can be cooked all kinds of ways, and the flavor of the fish is mild. Here, it is steamed with vegetables and herbs. The fried lionfish turns golden brown and gets crispy as it cooks. Chadwick told HuffPost that Norman's Cay tries to promote lionfish more than any other menu option. Customers like it, too. Often they call ahead to make sure the restaurant has a fresh supply before going there to eat. The fish aren't just cooked whole. Fillets are fried and prepared the same way as whole fish, or served in tacos, which Chadwick said are one of the restaurant's most popular lionfish options. The fried lionfish is drizzled with honey and truffle oil. Servers at the restaurant are educated about the lionfish issue and can explain to customers where the fish come from and how eating them helps. After the honey, the fish is topped with spicy pickled peppers, onions and carrots, along with some of the vinegary brine. Daniels told us the recipes are from his from home, in Jamaica. The filets get the same preparation as the whole fish. In order to make catching the fish easier, Chadwick is working on developing a trap that will lure lionfish. It's not an easy task, but may make it easier to establish a commercial market for the invasive species. "Eventually I'd like to create my own supply chain in the Bahamas with these traps," Chadwick said. The steamed fish is done cooking. To convince customers to try lionfish and educate them on how it helps ocean ecosystems, Norman's Cay puts notes about lionfish on every table. 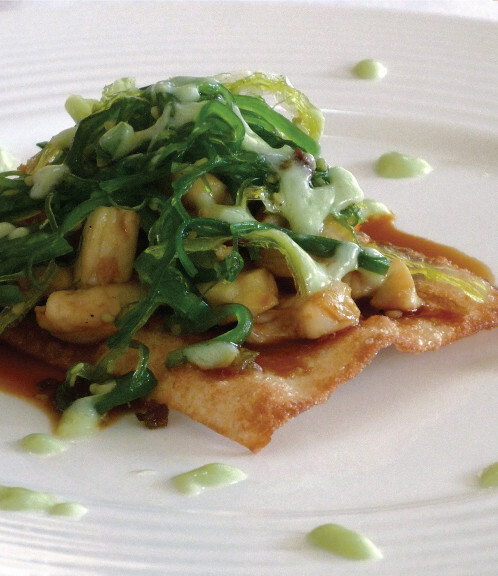 Each of the dishes is beautifully plated with lime slices and green onions. Tasting the final dish. The lionfish had a mild flavor similar to other white fish and a pleasant, meaty texture. The lionfish generally gets a good reception with customers. "People like to try new things," Chadwick said. Want to try another recipe? Here's a different take on lionfish, reprinted with permission from The Lionfish Cookbook. REEF also has resources for finding lionfish in your area.